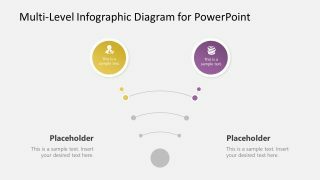 The Multi-Level Infographic Diagram for PowerPoint is a semi-circle template with three sub-processes in an arch shape. It is a multi-purpose colorful PowerPoint containing circular units and infographics icons. These infographic icons visually represent segments as elements of curve flow process. For example, user and check sign illustrate user access verification whereas, lightbulb depicts innovative ideas. Similarly, coins are for monetary discussions, a bar chart for statistics, and dartboard for goals and objectives. 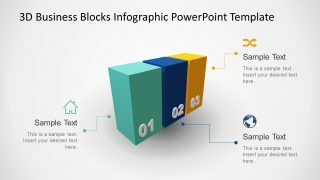 This template of multi-level infographics design has 4 slides with different versions of similar PowerPoint diagram. 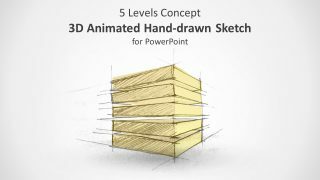 These include five, four, three, and two segment multi-level infographic diagrams. 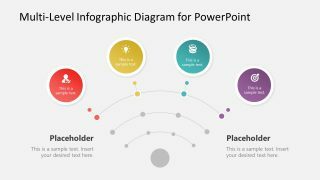 The Multi-Level Infographic Diagram for PowerPoint can help display various presentation ideas. For example, replacing traditional bullet list format, a linear process flow, or explaining 4 types/categories. However, this diagram can also show a relationship of circular segments to one central idea. The gray circle shape could present that central idea i.e. core element of diagram. 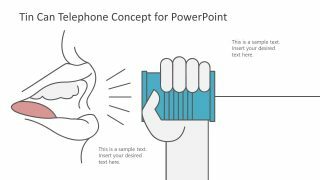 It is an appealing PowerPoint template to demonstrate any topic from business concept models to research and learning presentations. 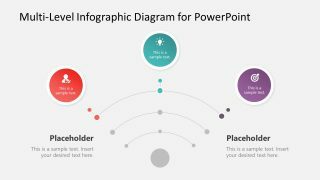 The editing features assist users to customize colors, text, shapes, and size of multi-level infographic diagram of PowerPoint. For instance, select a circular segment and change its shape fill. Or, customize the background by adding colors, patterns, or pictures. Moreover, replace the icons of diagram with shapes and icons relevant to presentation’s topic. 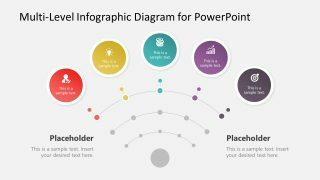 The PowerPoint diagram template of multi-level infographic segments graphically supports content of presentation. 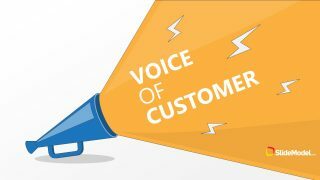 Since visual graphics that are relevant to information helps in remembering ideas or keywords. Further, use of shapes and icons help present accurate information in the correct sequence. With this minimalist design of multi-level infographic diagram, users can deliver information more effectively.